LOS ANGELES — Beachgoers can check the water quality of their favorite beaches before planning a day on the sand, thanks to Heal the Bay’s 23rd annual Beach Report Card. Surfers who frequent The Wedge in Newport Beach will be glad to know the site earned an A+ — and so did Cabrillo Beach in San Pedro. Approximately 413 beaches statewide (93 percent) earned A or B grades during the summer months (April-October 2012) — a 1 percent increase from past reporting years. A total of 35 beaches made the “honor roll” with A+ grades. The improvement in water quality can be attributed to several factors, such as infrastructure improvements aimed at curbing bacterial pollution in dense urban centers — and two years of low rainfall in Southern California also seems to have played a major role in improved grades, according to the report. “Rainstorms greatly increase the amount of urban runoff, the greatest source of bacterial pollution at local beaches,” the report stated. A total of 14 beaches (3 percent) that were monitored statewide earned D or F grades during summer. High bacteria levels are linked to potential issues, stomach flu, ear infections and skin rashes, according to Heal the Bay. Unfortunately, the popular Avalon Harbor Beach on Catalina Island ranked as the top beach on the Top 10 Beach Bummers list. The beach was ranked at the top of the list in 2009, 2010 and 2012. For more information, visit healthebay.org/our-work/2013-beach-report-card. San Diego County continued to earn excellent beach water scores, with 99 percent of all monitoring locations receiving an A or B grade during summer dry weather, 98 percent getting A or B grades during winter dry weather, and weather grades up 10 percent from the last report. The Tijuana River mouth is the only monitoring location in San Diego to land on the Beach Bummer’s list. Orange County came in with 93 percent A or B grades. Wet weather A and B grades were up 4 percent from last year’s ratings and bested the five-year average by 17 percent. Doheny State Beach and Poche Beach landed on the Beach Bummer list. Los Angeles County beach water quality scored 84 percent A or B grades during the summer dry months. Wet weather A and B grades were up by 4 percent from last year and bested the five-year average by 16 percent. The county’s wet weather A and B scores were up 23 percent from last year, with 57 percent A or B scores. Four Los Angeles County beaches made the Beach Bummer list. 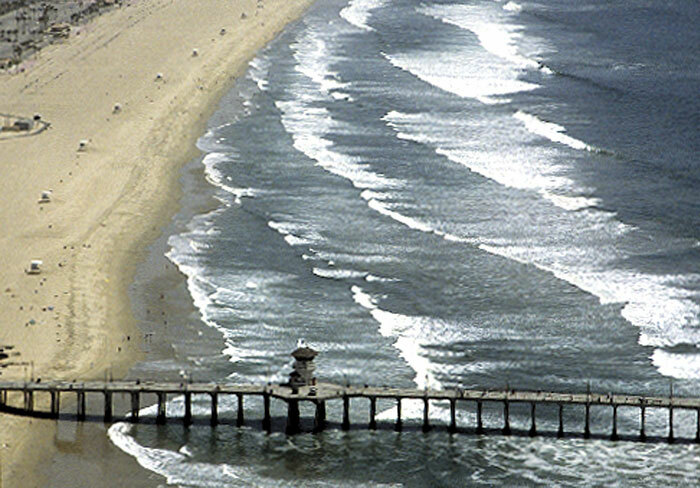 Ventura County beach monitoring sites scored A grades during summer dry and winter seasons, and 20 of 21 locations earned A or B grades during wet weather. Local beaches bested the five-year average during winter dry and wet weather and beat the statewide average for all three time periods. Santa Barbara County exhibited excellent water quality, with 100 percent A or B grades during the summer and winter dry weather. Wet water quality was good, with 94 percent A or B grades — 51 percent above the five-year county average, besting the statewide average by 25 percent.